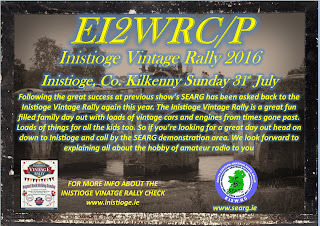 We will be QRV as EI2WRC/p from Inistioge, Co. Kilkenny on Sunday 31 July from about 10 a.m. onwards. Activity will be mainly on HF (SSB and CW) with the likelihood that activities will be concentrated on 40m (depending on band conditions). In keeping with the 'vintage' theme, we will operate some Morse Code (CW) if band conditions permit. The Inistioge Vintage Rally is a fun filled family day out with lots of vintage vehicles on show. If you’re looking for a great family day out, head on down to Inistioge and call by the SEARG demonstration area where we will be delighted to meet you.